I have something very special in store for you today! A guest review!! My lovely friend, Sophie is here today to review one of her (and my) favourite books! Now here is a bit of background! Sophie and I met through a mutual friend and have since become really good friends! We convinced each other to start blogs. Mine a book blog and hers a beauty blog. Well here we both are now! So please make her feel welcome (though I know you will!). Hi, everyone! My name's Sophie and I'm here to review a book by one of my favourite authors, Sophie Kinsella. Amy the Reader is one of my favourite people, both in the blogging world and real life, so I'm really excited to have a chance to share this fantastic book with you all. Just quickly, I write a beauty blog called Born to Buy and I'd love for you to check it out! From Goodreads: "Emma is like every girl in the world. She has a few little secrets. 2. I'm a size twelve. Not a size eight, like Connor thinks. 3. I've always thought Connor looks a bit like Ken. As in Barbie and Ken. ...until she spills them all to a stranger on a plane. At least, she thought he was a stranger..."
Imagine being on a plane on your way back and thinking you're going to die. Why? Because you've had one too many drinks and there's a lot of turbulence. Now imagine sharing alllll your secrets with the stranger next to you, including the fact that you just stuffed up the business deal you were in charge of. Why? Because it doesn't matter if you're about to crash, right? NOW imagine turning up for work and finding out that the stranger is, in fact, the owner and CEO of Panther Cola, the place you work! Throw in a clingy boyfriend, an irritating cousin and horrible colleagues and you've got yourself a great book! In a sentence, I love Can You Keep a Secret. Being one of my favourite authors, I don't think Sophie Kinsella ever gets it wrong but, in this case, she got it so right. All females tell little white lies, making the premise of the novel so relatable to us ladies. The character, Emma Corrigan, is so 'normal'. She's a girl with a job she knows very little about, a knack for thrift shopping, rocking second hand chic, and a very awkward situation on her hands! 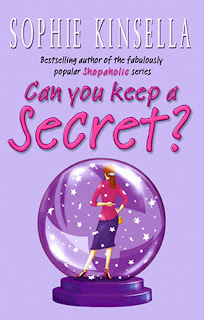 Whilst Can You Keep a Secret is not the most realistic story I've ever read, it sure is entertaining! Sophie Kinsella's novels are always full of laughs and this is no exception. The way in which Emma's boss, Jack Harper, reminds her that he remembers her, as well as every secret she spilled, is hilarious. He doesn't come out and say it, no. Instead he drops hints and makes subtle comments wherever possible, much to my amusement. Whilst I do believe that Sophie Kinsella's female lead characters are all very similar, they're somehow very different. Emma Corrigan is nothing like Rebecca Bloomwood (Confessions of a Shopaholic series) and Samantha Sweeting (The Undomestic Goddess), they all possess the same fun loving qualities that make you fall in love with them and, of course, want to continue reading their story long after the book is finally over. All in all, I love this book and I recommend it to everyone. Did I mention that enough? If this review isn't enough of an indication of how much I enjoyed reading it, what about the fact that I've re read it at least five times? Nope, it never gets old. If you love chick lit or you're a fan of Sophie Kinsella's other work, especially Confessions of a Shopaholic, you'll love this book! The only thing I didn't like about this book is that it ended and there isn't a sequel. Have any of your read this book or other books from Sophie Kinsella? What did you think? Also, thanks again to Amy for inviting me to be a part of Following the Reader. If you head to my blog, Born to Buy, Amy is writing a series on her experiences studying Cert II in Retail Make up and Skincare. Click here to read it! So there you have it folks!! Sophie's first book review! Make sure you check out her blog: Born to Buy and also my feature: Brushing Up on her blog! Does anyone else out there love Sophie Kinsella as much as we do? Have you heard she has a new book coming out soon! Sophie, I loved your review. I've been meaning to check this book out and you just made me add it to my "books I must buy really soon or get from the library asap" list! I also want to check out this author's book "I've Got Your Number" Have you or Amy read that one yet? I just came across this blog. Love it! Thanks, Kay. I really appreciate that. I'd definitely add Can You Keep a Secret? to your book shopping list. I've also read I've Got Your Number, yes, and it was just as good. As a blanket rule, anything by Sophie Kinsella is fantastic.